The 50 Series™ H.D. muffler is Designed primarily for today's higher horsepower trucks such as the Dodge HEMI. This muffler will perform well on various vehicles when a deeper, more aggressive tone is desired. 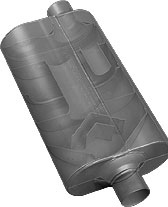 This new muffler features a 4.00-inch internal design, which is ideal for trucks with modified engines. It is built from 16 gauge aluminized steel and comes with various inlet/outlet configurations.